These basic stuffed mushrooms get some smoky flavor from the diced cooked bacon. Feel free to use your favorite seasoned salt blend in place of the plain salt, or use Cajun or Creole seasoning. Feel free to add some shredded cheese or grated Parmesan, or add some finely chopped pecans to the stuffing. Chopped dried cranberries can add unexpected flavor as well. See the tips and variations for more alternative ingredients and ideas. 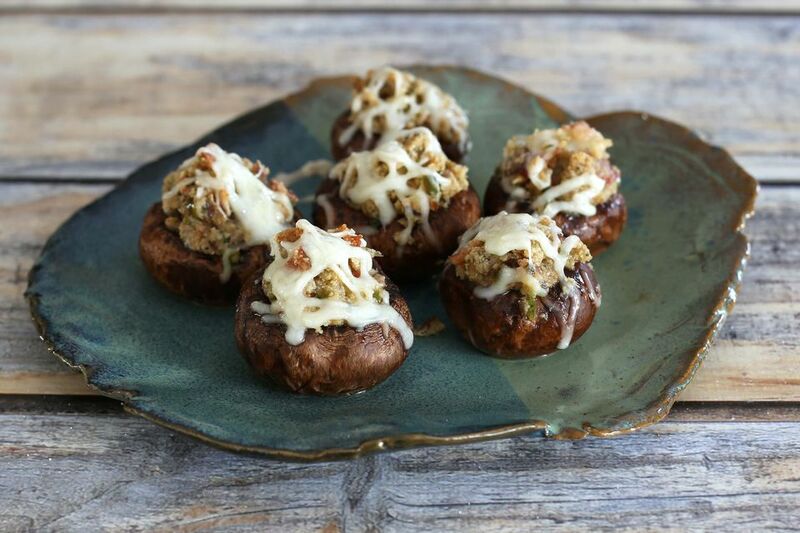 Use large button mushrooms or portobello mushrooms to make these stuffed mushrooms. In a large skillet over medium heat, cook the bacon strips until crisp. Remove to paper towels to drain. Leave 1 tablespoon of drippings in the pan and add 1 tablespoon of butter. Remove the stems from the mushrooms, leaving caps whole for stuffing. Chop the stems finely. Place the skillet with the butter and drippings over medium heat. Saute the finely chopped mushroom stems with the chopped onion and garlic until tender, about 5 minutes. Stir in the cooked crumbled bacon, parsley, salt, pepper, moistened bread, and egg. Mix to blend thoroughly. Fill the mushroom caps with the mixture and arrange them in the prepared baking dish. Melt the remaining 1 tablespoon of butter. Toss the fine bread crumbs with the melted butter and sprinkle over the mushrooms. Bake the stuffed mushrooms in the preheated oven for 20 to 25 minutes, until nicely browned. Replace the bacon with minced ham or Canadian bacon and replace the bacon drippings with another tablespoon of butter, Saute the minced ham along with the mushroom stems and onion. Replace the bacon with about 1/2 cup of ground pork sausage, browned. Use 1 tablespoon of the sausage drippings with the 1 tablespoon of butter to saute the chopped stems and onion. Add 2 tablespoons of grated Parmesan cheese to the stuffing mixture and sprinkle with a small amount of Parmesan before baking. Top each stuffed mushroom with a small amount of shredded mozzarella cheese or fontina cheese. Add 2 tablespoons of finely chopped toasted walnuts or pecans to the stuffing for extra crunch. Add a tablespoon or two of chopped dried cranberries.